Del. Heather Mizeur speaks at Towson University debate sponsored by the Baltimore Economic Forum. She and two other Democrats responded to questions from a panel that included, from left, Towson president Maravene Loeschke, Don Fry of the Greater Baltimore Committee, Sam DiPaola of SunTrust bank, Scott Dorsey of Merritt Properties, Jerry Wit of St. John Properties, chairman of Maryland Business for Responsive Government. The thousands of seats at Towson University’s basketball arena were not occupied by screaming fans Thursday evening, but by roughly 40 Baltimore locals, business owners and a smattering of students, the audience for a forum with the three Democratic gubernatorial candidates. The sponsor, the Greater Baltimore Economic Forum, intended the forum to be a chance for both university and the surrounding community to scrutinize the candidates before the June 24 primary, but few students showed up. College students, the generation dubbed as “millennials,” tend not to overwhelmingly influence an election, said Laura Hussey, a political science professor teaching American public policy at University of Maryland Baltimore County, Few posses the fiscal resources to grab a candidate’s attention. Interest groups, however, and political parties, tend to notice when individual candidates devote their time appealing to younger voters, the generation that will serve as the future workforce behind their causes, Hussey said, which is why candidates always attempt to woo students. The three candidates, Montgomery County Del. Heather Mizeur, Lt. Gov. Anthony Brown and Attorney General Doug Gansler, each had 20 minutes to plead their case to why they should win the party nomination. Each of the candidates took shots at the other, with Gansler the most aggressive in his attacks on Brown for poor performance of the Health Exchange and the business climate in the state. Mizeur “rejected the notion that Maryland is unfriendly to business,” citing the second lowest corporate tax rate in the region. Brown, for his part, refused to get into the debate about the business climate, but said Maryland needed to do better. Because the Greater Baltimore Economic Forum, an advocacy group for economic policy education and businesses, organized the event, most of the questions centered on tax reform and the state’s fiscal future. 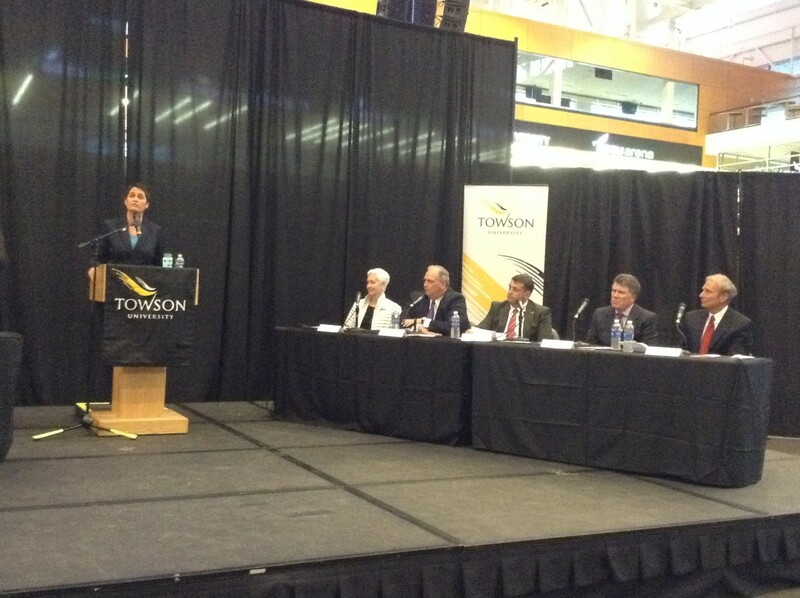 Only Maravene Loeschke, Towson University’s president, asked the candidates to address higher education. Brandon Wharton, a freshman at Towson, said out of all the topics the candidates spoke on, only their solutions for affordable education really piqued his interest. “One of the things we’re known for is our education, when we talk about business coming, people aren’t going to want to come with their families if they don’t believe in higher education,” Wharton said. Wharton said he was impressed with Gansler and Mizeur, while Brown was more of the “status quo” option. Brown said he would invest more in statewide facilities for four-year institutions and community colleges, and said those types of investments would attract new businesses. Mizeur would offer low-interest student loans based on financial need, rather than purely merit, while Gansler touted his office’s study into the diversity of students attending school — Gansler said he wanted to improve the graduation rate of the K-12 schools, particularly in Baltimore. Bob Latshaw, chairman of the Greater Baltimore Economic Forum, said of those who pre-registered for the event, roughly a third were Towson students and faculty. Latshaw said he was trying to attract students from Goucher, UMBC and Towson. “Kids are excited about it,” Latshaw said. Hussey said students often cannot vote in college because they might come from out-of-state. As an educator, she said she often sees academic stress eclipsing any interest in political action or campaigns. Chris Jensen, director of civic engagement at Towson, said the university has instituted a number of programs designed to engage student interest in contemporary political climate. Towson has registered for TurboVote, a system that allows students to register and vote in their home state. Jensen said he observes a lot of students participating in non-traditional projects or grassroots initiatives. Rather than calling a representative, students might organize a small informational session about a particular social issue. “That’s what we encourage,” he said. A WBAL radio report includes audio of full remarks by each candidate at the forum.